Among all this recent talk of Stephen Collins' indiscretions, I saw a little article pop up from the family of a minor Seventh Heaven character. It was about how networks might drop reruns of the show because of Collins' behavior, and how they would lose out on royalties or whatever it's called in the television industry. That family was the Saletta family -- daughter Niki played Simon Camden's first (?) girlfriend on the show, and son Sam most memorably played one of the bullies in the 1994 version of The Little Rascals (apparently he was, at one point, on Seventh Heaven as well). But I remember the Salettas from MySpace. 2005-2006 was a weird time on the internets, if you ask me. Social networking was just beginning to take off, and no one knew the rules. For a short while, it seemed like no one cared about the rules. I wasn't in the United States during that period. I was five hours ahead of the East Coast, in the United Kingdom, and keeping a watchful eye on American pop culture. I don't remember the sequence of events, but I must've become MySpace friends with someone who knew someone, because this new world of L.A. movers and shakers opened up to me. I was friends with Shia LaBeouf for close to a year until he shut his page down and I stopped checking my MySpace. That was when MySpace started losing ground to Facebook. So back in 2005ish, I stumbled upon Niki Saletta's MySpace and that led me to her brother Sam's alternative/progressive rock band, Jubala. I loved their sound and I loved that they were unsigned. I guess MySpace served its purpose back then of bringing exposure to creative types. We were all around the same age, and if there was such a thing as an internet groupie, I think I was that for Jubala. I wished I could be in Los Angeles to go to their shows, and I listened the crap outta their little playlist (all of which is gone now, RIP Original MySpace). My favorite song was "This High," and I revisited it again when I saw the Salettas in the news. I see some of that 2005-2006 MySpace crowd in paparazzi photos with some of the Young Hollywood A through C-listers (Selena Gomez, Justin Bieber, Vanessa Hudgens, etc.) and it's always kind of weird, especially since we're quite a bit older than the current Young Hollywood pack. 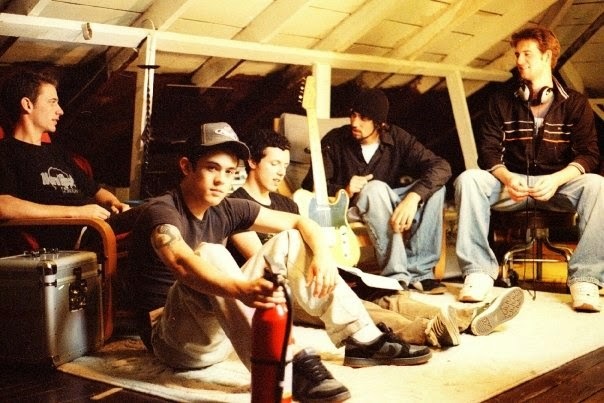 Jubala disbanded in 2009, but their music lives on ... and "This High" is still that good. What a killer intro. A newer version of the band's MySpace page still exists.